Sounds like a really good release so far. Do you know if Amazon Prime works with the flash release? Is Bluetooth working? Does it play 1080p x264 stuff fluently? Can i upgrade to X1 from the previous version directly without reflash ? Sorry, You must reflash. BTW, the kernel is now managed by apt, if you want the latest kernel just type apt-get install linux-image. I will provide the latest kernel as a standard deb package. 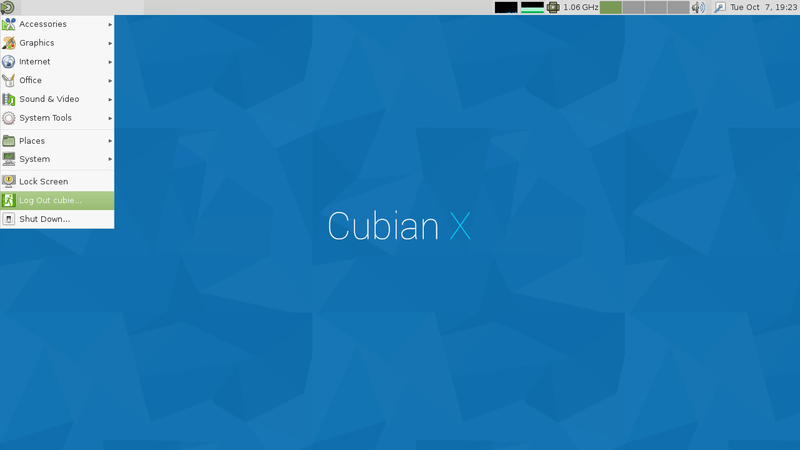 cubian-update is working just for backward compatbility. BTW, the kernel is now managed by apt, if you want the latest kernel just type apt-get install linux-image. is this only for cubian X1 or also for previous version ? Ok thanks, I will try this evening. So i picked linux-image-3.4.79-sun7i to install. kernel managed by the apt repository is a very good idea. Will share for a while on my seedbox. Don't need the space. Getting errors from the tracker though. I tried this image out. Like the Mate interface a lot! It will not run a 1080p video at all, and a 720p is so choppy its not usable. Running glxgears gives only 42 FPS and sunxi-es2gears gives only 60 FPS. The Qbee-X image gives over 500 FPS with glxgears. So I can only assume that Mali has not been properly installed. I guess this image has a long way to go. You will get a 300+fps using sunxi-es2gears. AFAIK, glxgears is for OpenGL, MALI only supports OpenGL ES, so, I quite doubted the number 500FPS. Error: Requested MapBuffer VBO update method but GL_OES_mapbuffer is not supported! Although Aruntu is not as fast as Q-bee X was it still posts very impressive results, as the MALI is not exactly a high powered Graphics Processor (GP). The only reason that I use glxgears is that when another program needs OpenGL ( in what ever form it can find) it uses the same methods as glxgears to find the libs. For instance I build OpenCPN often and it needs OpenGL ES2 at least. If you have not done the work with glshim and glues and installing them in the proper place, when some other (non custom application) needs OpenGL it will not find it and fail to build properly. Sunxi-ex2gears was custom built just for this processor and has been informed by the builders where to find the proper libs, but no other application knows this. All of my videos are built with x264 and none of them seem to work on this distribution. I did use the installed SMplayer, that was what gave the bad results. But the same files running on the same hardware play fine with Q-bee X and Aruntu. I stand by my results. Thanks, I never know something like glshim. If you find any problems on cubian, it's recommended create an issue on github. The problem and the way we resolve it is transparent for other users or developers. I will aslo test the video decoding performance problem. Thanks for pointing out those issues.